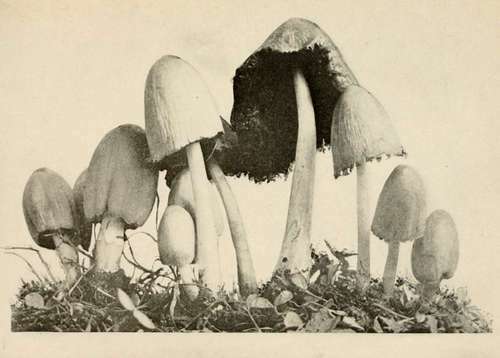 The Inky Cap, formally known as Coprinus atramentarius, is an extremely common fungus in north America. Always found in clusters, the mushrooms can make for a delicious meal–or a disastrous one. But we’ll get back to the Inky Cap’s darker side later. First, the source of their name: “atramentarius” comes from the Latin atramentum for ink. Inky Caps have this really cool habit of disintegrating as they age. 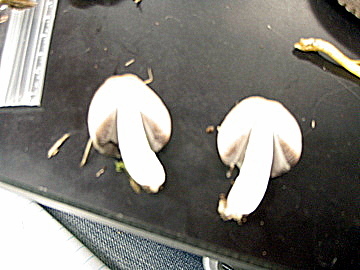 Their caps go from being bell-shaped to flat, the flesh oozing into a black goo. This is actually a mechanism for maximizing spore dispersal, but humans can hijack the process and use them for ink. If you pick Inkies, as I like to call them, they’ll rapidly collapse into a little black puddle unless dried immediately. So why are Inky Caps good to eat, but only sometimes? You can get a hint from another nickname of theirs: Tippler’s Bane. If you eat these babies within a few hours (or even days) of consuming alcohol, you’ll experience symptoms similar to those caused by disulfiram. In other words, you’ll suffer from vomiting, palpitations, and other symptoms of alcohol poisoning. You might think it can’t be all that bad, but I have it on good authority that it really, really is. Trust me, mycologists in grad school will try anything once, then con their friends into trying it at least twice. The mushrooms contain coprine, which inhibits the action of acetaldehyde dehydrogenase, the enzyme that allows us to break down ethanol and its components. The reaction is chemically similar to that caused by Disulfiram, a drug given to chronic alcoholics to break their addiction through good-old-fashioned pain and suffering. 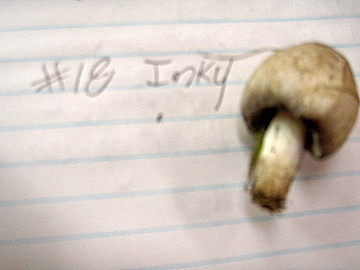 In a nutshell, the Inky Cap is plentiful, fun to play with in the lab, and potentially vomitous. This fungirl’s verdict is that this mushroom can make a delicious meal, but isn’t worth the worry unless you can count on abstaining for at least a week. Of course, you should never eat a mushroom you’ve foraged unless an expert is there to confirm the species for you! And never ask an expert to confirm a species for you without inviting them to dinner first.